I know it has been a few days since I last posted so I thought I better get something done today. I was so torn today between going outside or staying inside and work on a card and the card won out. I actually had the card base already made from a Close To My Heart Consultant Meeting that I just attended where we all design a card for all of us to do. Tara C. came up with this card for us to do. I had finished the card base but was unsure what I wantedto use the card for so I had not added anything to the front and so it has been sitting on my work table just calling to me to be finished. I had not used Susan’s Garden Coreopsis die yet and decided that they would look good on the front of this card. The card base is called Herringbone and you can find the tutorial here The paper used on my card is Close To My Heart Fundamentals Basic and Enchanted papers. 1. 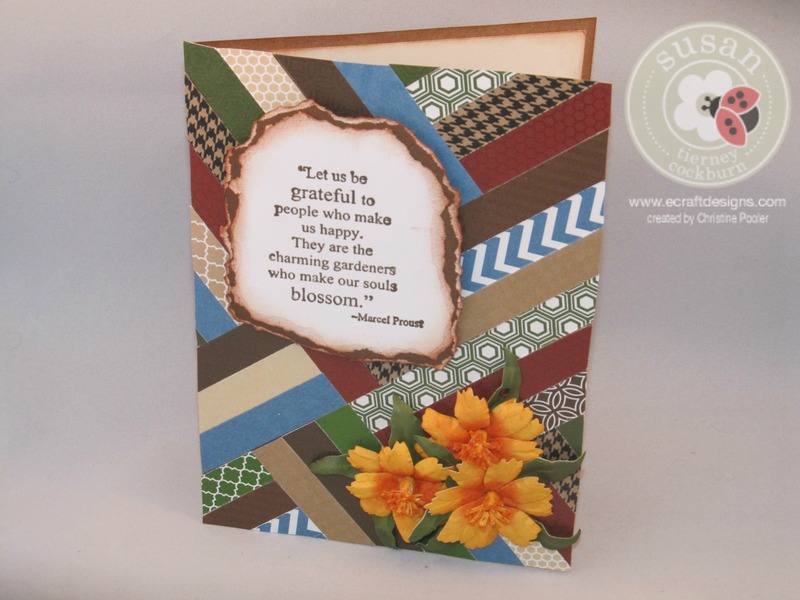 Using Kraft cardstock cut a piece 7 X 10 and score at 5″ fold on score line and crease. 4. Die cut, shade, shape and build 3 Coreopsis flowers using Susan’s Garden Coreopsis die. Using yellow cardstock (I used Honey) cut the petals and the stamens. Using green cardstock (I used Olive) cut the leaves and the calyx. Place the calyx onto the molding pad and with the ball tool cup the calyx. Color the base of each petal (I used Red Iron Oxide Pan Pastels but I think markers would work better). Place petals right side down on molding mat and shape with the loop tool from Susan’s 4 pc Tool Kit. Then turn the over and I gently straightened them a litttle bit being careful not to take the shape out. Take the stamen and cut each one in half (Elizabeth Craft Designs Fine Scissors are great for this) Apply glue to the bottom of the stamen all the way across but do not glue the little tab roll up. Spread out the stamens dip in glue and then into the reddish orange pollen. Dip the bottom into glue and place in the center of the flower. Place leaves on leaf mat right side down and make a vein line down the middle of the leaf using the leaf tool. Turn over pinch each leaf on the vein line and add a little light green Pan Pastel then with tweezers pinch back and then with ball tool and molding pad curl the end of each leaf. 5. Stamp Susan’s Stamp Let Us Be Grateful using brown alcohol ink then sprinkle with clear embossing powder on white cardstock and heat set. Tear around the edges and ink with distress ink. Adhere to brown (Cocoa) cardstock and then tear around the edges leaving a little brown all the way around – ink edges. Adhere to the upper left of the card using pop dots. Hope this is an inspiration to you as this was a fun card and I can’t wait to try some more of these Herringbone cards. Wow ! What a difference the flowers make !!! From masculine to feminine just like that !! !